Last week, the Ballroom at Mayfair’s Hilton Hotel was the venue for the Video Game BAFTA’s sponserd by GAME. There was an atmosphere filled with excitement and anticipation. Dara O’Brien presented the evening and was joined by celebrities such as the legendary Robert Llewellyn, Jason Bradbury, the boys from Blue, Danny Wallace to name but a few. My personal favourite of 2010, ‘Heavy Rain‘ walked away with 3 awards – Best Technical Innovation, Best Original Music and Best Story. 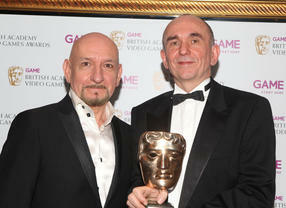 Despite winning three awards of the evening, they were just pipped to the post for Best Game by ‘Mass Effect 2‘. Unsurprisingly, the Best Family Game went to ‘Kinect Sports‘. Kinect, was certainly one of the big winners in 2010 and was certainly a well deserved winner of this category.